The United Kingdom has finally shaken off the globally-held reputation that it is not a country that produces some of the world’s finest cuisine. In towns and cities across the nation, there are restaurants, gastropubs and bars redefining contemporary British dining, proving that the modern British menu is a sum total greater than meat pies, garden veg and fish and chips (not that there’s anything wrong with these wonderful things). Of course, the well-informed know that the UK has been a cultural home for fine food for decades. Restaurants such as the Michelin-starred St. John, where chef Fergus Henderson pioneered “nose to tail eating” – cooking and dining on the whole animal – have been serving exquisite plates of food since the mid-90s. Or those such as Shoreditch’s Clove Club, constantly displacing expectations with its wildly innovative tasting menu, which currently sees it ranked at #33 in the World’s 50 Best Restaurants list. Beer has also experienced a similar culinary revival over the past decade. While the UK has long been revered internationally for being a producer of masterfully put together, nuanced cask ale, its nascent beer scene has steadily built a strong reputation on top of that over the past decade. In fact the UK could now be considered to be a modern brewing powerhouse—perhaps behind only the United States in terms of influence. 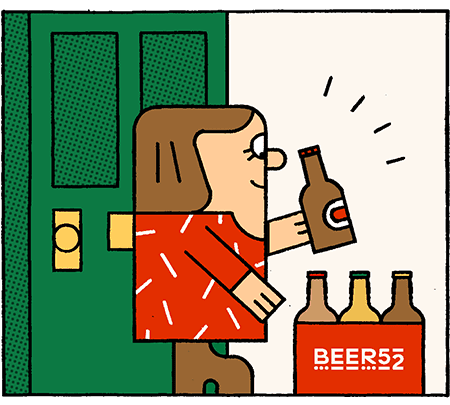 It’s been said by many writers before—myself included—but with over 2000 breweries nationally, producing an increasingly eclectic array of beers, there really has never been a better time to be a British beer drinker. But, there is a disconnect between the world of the restaurant, and that of the brewery. One that no amount of beer and food matching books or events has seemingly managed to bridge. Beer still remains a footnote on the wine list within the UK’s best dining establishments. And when it is present, it is still served within aroma-displacing frosted tankards, or other inappropriate glassware. It is not treated with the same care and attention that a properly-trained sommelier gives to their wine list. Our favourite beverage is barely managing to play second fiddle to wine within the restaurant space. “It’s partly snobbery. In this country at least, beer has traditionally been the drink of the working class and its natural home the pub. Wine’s natural home is the restaurant,” Tom Harris, chef co-owner of The Marksman on East London’s Hackney Road tells me. “Wine and beer have different evolutionary arcs: wine has been produced to accompany food. Beer on the other hand has been brewed as a thirst quencher for workers. The Marksman could be seen as one London restaurant that is truly embracing the evolution of modern British beer. It is a pub, after all, so beer is a very natural part of this establishments offering. Handpulls serving well-conditioned cask ales line up along the bar beside modern contemporaries such as Redchurch or Thornbridge on keg. The quality of beer matches that of the carefully put together plates Harris and fellow chef co-owner Jon Rotheram have conceived. Despite this, when we are escorted upstairs to dine at The Marksman, beer once again is standing at the foot of wine’s lofty podium. In fact despite the array on draft and in bottle available below, beer does not feature on The Marksman’s wine list at all. This is a common feature of London’s best restaurants. Around the corner from The Marksman on Columbia Road is Brawn, where I can honestly say I have experienced some of the best meals in my life. The start of its menu features seven carefully curated beers—five of which are from London brewery The Kernel—however, the wine list that follows is 14 pages long. At Michelin-starred Lyle’s in Shoreditch, beer also features. Described as “pre-drinks,” four beers, feature alongside a selection of 57 wines (at last count.) Once again, Kernel bottles are present, but it seems unfortunate that on this list, the restaurant ranked 37th in the world has misspelled Lager as “Larger.” Perhaps defining the restaurant world’s view of beer with a single typo. Despite my lamentation of the state of the beer list within some of my favourite dining establishments, the general picture is not all doom and gloom—although I still feel beer has a long road to travel before it’s treated with the same care as wine within this space. However, thanks to a new wave of restaurants embracing beer, change is in the air. And, as with many points of evolution within the beer industry, it’s coming from the brewery floor. Although Solvay Society is a very small brewery, its beer is a relatively common site at some of London’s top specialist beer destinations. It was in one of these, Bethnal Green’s Mother Kelly’s, that Charlie Macintosh—who runs the front of house at Lyle’s, came across one of its Saisons. Following this, he got in touch with Hochuli and asked if he could come and help out at the brewery. Initially Macintosh helped Solvay Society to brew its Coulomb Saison, which he subsequently ordered two cases of for the restaurant. This perhaps proving—embarrassing menu typos aside—that there is definitely interest in great beer from this particular restaurant. Macintosh continued to help at the brewery, helping out with cleaning, brewing, packaging, and whatever else he could get involved with. Eventually, mooting to Hochuli that he would like to brew a beer of his own. So that’s exactly what they did. As a restaurant, Lyle’s is a champion of local ingredients, so the same approach was taken with this beer. Whole leaf Goldings from Kent’s Gushmere Court Farm were added to a Belgian-style Session Blonde Ale, which was fermented out using a fresh crop of Solvay Society’s house yeast. Solvay Society isn’t the only brewery to team up with a top restaurant to create a beer for the high-end dining market. London’s Brew by Numbers have also done similar by designing a beer for The Wigmore—a high end gastropub with a menu, curated by none other than Chef Michel Roux Jr.—located on Regent Street in London’s West End. As with Solvay Society the resulting beer was a Saison (a style that pairs exceptionally well with many dishes due to both its complexity and ability to offer refreshment). The Brewery even got to work beside Roux Jr. as they developed the resulting beer, the recipe of which is updated to reflect the current season, as with the menu at The Wigmore. Sadly the two examples above, as great as they are for both the worlds of beer and food, are not the norm. A sprinkling of fortuitousness led Lyle’s to Solvay Society, and for Brew by Numbers, a case of already having industry contacts in the know has helped connect them with the food sector. For most breweries, they have to deal with wholesalers, which in turn deal with the restaurants. Wine, with its provenance, and terroir, and the way it is so instilled into the culture of food, has a distinct advantage over beer at this stage. One beverage that’s eeking out some success in this field is cider—the good kind of cider. I’m not talking about the fizzy, sugar laden stuff that passes for cider in a typical pub or the cloudy stuff that comes out of a box (which can sometimes admittedly be very good, but also sometimes very bad.) No, I’m talking about the low intervention, artisanally made cider from the likes of Tom Oliver, and Little Pomona in Herefordshire. Thanks to simple, yet artful presentation in 750ml bottles, and flavours that mingle brilliantly with food, cider is also gradually finding its way to the dining table—perhaps even leapfrogging beer on the way there. For Nash, this camaraderie between cider and wine is something that makes it more appealing for his customers. And by his own admission, he finds it an easier task to sell the high-end ciders he wholesales to restaurants than he does to specialist beer and cider retailers. Thanks to him, you’ll find ciders like those by Oliver and Little Ponoma at establishments like Brawn or The Marksman. In fact, beer could learn a great deal from this approach. The way I see it there are two main issues for it to overcome if it is to be a success at the dinner table, both are complex. The first is the way beer is presented. Beer is a product obsessed with brand. Try to think of a brand of high-end wine and you’ll struggle—but think of a grape or flavour profile and you’ll think of several. Perhaps this is why The Kernel is commonly found within top restaurants—here is a brewery that has eschewed brand in favour of product and provenance. A different type of thinking is involved from breweries if they intend to succeed in breaking into the food world. The second, perhaps greater challenge, is margin. If we want exceptional beer to drink with your food at the finest restaurants, then we must be prepared to pay for the privilege. Currently, eating establishments are able to make significant margins on fine wines—they are not able to do this with beer, even 750ml bottles of barrel aged and blended beer. If consumers accept that it will cost more to enjoy that beer within a restaurant, then maybe they in turn will be encouraged to stock and sell it. 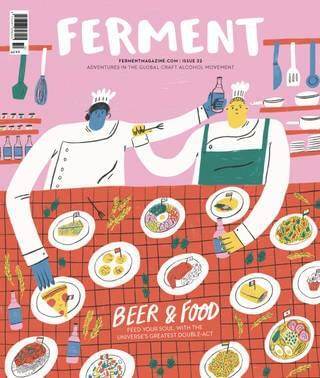 Before that however, we have a long way to go in terms of teaching the majority of the food world that there’s more to beer than slinging back pints of ale and lager, served by the pint (although never in a frosted tankard.) The next time you do eat out, tell your sommelier about your favourite beers. That’s one conversation definitely worth having. “It’s certainly a challenging market for beer to enter,” Brew by Numbers’ Tom Hutchings says, but one I personally think that beer is equal to.